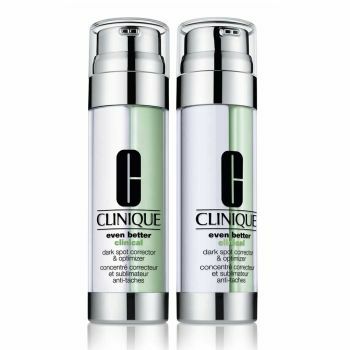 What It Is: Our clinical-strength serum visibly improves dark spots. What It Does: Even Better Clinical Serum is proven to help reverse the appearance of dark spots and blemish marks. See a visibly brighter complexion. Soothing Optimizer keeps skin calm, helping it better resist future darkening. Both are dispensed from a dual-chamber bottle that separates each serum.